The RiNo Rhino perfectly sums up the area's artistic culture. Why go now: This art district is booming but still feels like a secret—even to locals. Where is it? North of downtown, bordering the Platte River and the train tracks. What it used to be: All factories and warehouses in the 1930s. Who’s here: Sculptors, painters, ceramists, and mixed-media and you-name-it artists. The vibe: Anything but stuffy. Open studio nights are celebrations with food and wine, many spaces are live/work, and artists and gallery owners will chat with anyone interested enough to ask questions. By appointment: Most galleries have limited hours, but call ahead and you’ll likely get a private tour. Coolest time to come: First Fridays and Second Saturdays (Feb 3, 11; ), when many galleries and studios are open for the evening till 10 or 11. Reason to come back: For the local crafts and food, plus live music, at the Denver Handmade Homemade community market (once a month starting in Mar; for details).. 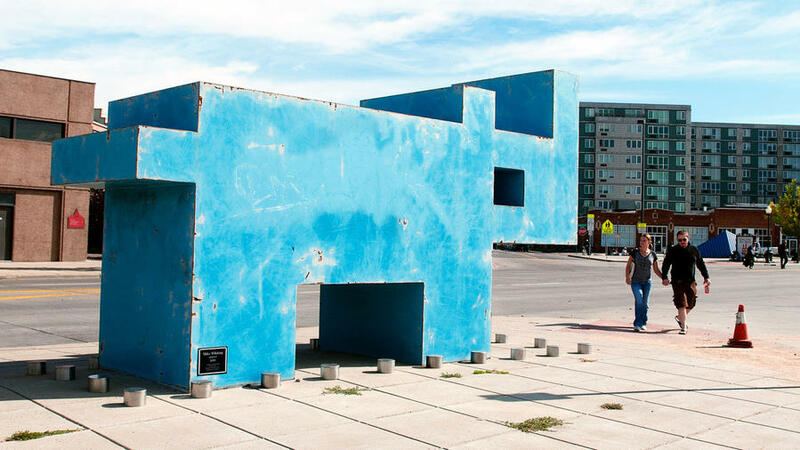 Neighborhood mascot: The RiNo Rhino, a pixelated blue rhino sculpture by local artist Michael Whiting, captures the area’s artistic spirit, at the intersection of Broadway, 24th, and Larimer Streets. Check out the unique sculpture garden at Ironton Studios and Gallery. Outdoor art: Roam the garden at Ironton Studios and Gallery, where sculptures are set up in vignettes outside under the trees. Most eye-catching: Yoshitomo Saito’s bronzes and the Hydrorondack chairs (former water-skis) by Chase DeForest. Inside, peek at the artists’ studios. Closed Sun, 3636 Chestnut Place, . One-of-a-kind shopping: From apparel and jewelry to artwork and furnishings, MegaFauna stocks merchandise designed and made in Denver—often right here in the neighborhood. Don’t miss the featherlike earrings fashioned from recycled bike inner tubes or the cufflinks carved from reclaimed wood, each with its own story of origin. 2701 Larimer St., . The Dry Ice Factory houses more than 30 painters’ and ceramists’ studios (pots pictured). Go behind the canvas: The Dry Ice Factory (First Fri, 3300 Walnut St., dryicefactory.org) has more than 30 painters’ and ceramists’ studios, plus 2 galleries. Across the tracks, check out the youthful vibe, with music and food trucks to boot, at 48-studio Wazee Union (Second Sat, 3501 Wazee St., ). Unwind at the Crema Coffee House, and enjoy the artwork from international artists. When you get hungry: Stop in for a cappucino, fresh juice, and quiche at Crema Coffee House ($, 2862 Larimer St., 720/284-9648), a foodie-meets-artist haven that rotates the interior artwork—and the facade mural—by international creatives. Or try the house-made cucumber soda and grilled cheese with peach chutney at Hutch & Spoon ($, closed Sun, 3090 Larimer, 303/296-2317). Visit Hinterland, an adventurous contemporary art gallery run by neighborhood taste-makers Sabin Aell and Randy Rushton. Like their home, the gallery is built entirely of reclaimed materials. By appointment; 3254 Walnut St.; . Pattern Shop Studio is the home gallery of RiNo veterans Sharon and Rex Brown. For 20 years, Sharon has been exhibiting her own and others’ work in the couple’s cozy home (once a pattern shop). Free tours; 6-9 First Fri, 4-6 Second Sat, and by appointment; 3349 Blake St.; . Browse the vases, dinnerware, and small ceramic sculptural objects at Plinth Gallery, which features a guest artist up front each month and more than 25 artists in its rear gallery. Then come back in May or June, when exhibited artists will offer workshops. Thu-Sat and by appointment; 3520 Brighton Blvd. ; .